[W]hen the first crash came I couldn’t talk about it to anyone, I was embarrassed and tried to brush it of as a little blip a few weeks on holiday would change that, but of course it doesn’t, even without knowing it you start to suppress your feelings and find other ways to cope, with me it was work that I used to fill the void, and it worked to for the longest time, whilst piece by piece I was breaking down inside. . . The second crash came and I took more notice as it was affecting my work in addition I was dealing with bullying in the workplace, and just under pressure, my health in general began to fail, I always had colds, my skin broke out and the tiredness, well put it this way sleep became a luxury, but still I fought it all with stubbornness, again ignoring advice to take things easier, seek help, I still didn’t believe this was happening to me. The last and final crash was the worst I won’t get into here my previous posts go over that, I nearly went over the edge, and somehow I hung on , it was a last stand to recovery, which is an even rockier road to traverse, but each day I try to that is a positive, small victories are what I aim for and pass off bad days as just that. The stigma that surrounds mental health is a tough one to crack, as people are conditioned to seeing it something to be avoided and only talked about in whispers, they don’t see the sheer courage it takes to come out and say I have Mental Health problems and I need help and ongoing support not avoidance, it’s everyone’s problem and making it taboo only drives this life changing illness further underground. Read more of therabbitholez’s story. Visit Me & My Shadow | The Rabbit Hole. This entry was posted in The Rabbit Hole and tagged Blog For Mental Health 2015, health and wellness, mental health on 2015/03/22 by Ruby Tuesday. I have had a first hand experience of mental illness, in other words depression. I have been the ‘melancholic’ kinds ever since childhood. I was asked to ‘lighten up’ and ‘stop being moody’. The ‘sad’ days would happen in response to an event or because of an unfulfilled expectation. Then, for the next few years, I would feel unhappy at regular intervals. Every few days, I would go off food and feel lethargic and tired. I don’t think anybody understood what this was all about. Nor did I. I remember a depressive episode from when I was 11 or so. I thought it was in my genes- to feel sad. After a major (by my standards) episode a couple of years ago, I had to take charge. To handle this condition or be consumed myself. With God’s grace, I recovered and have educated myself extensively to manage a relapse. . . There is a lot of social stigma attached to mental illness. An understanding friend and I share our problems and ‘sadness’ and analyse our situation. Beyond that we do not talk about it openly. We would probably be ostracized if we did. I may be met with disapproval for saying that it is important to learn to take charge. I know it is near to impossible to be in control but when you are better and in between episodes, try to understand yourself. Each case is unique and it helps if you know yours better. The mental health expert would find it useful. Try to know your triggers, the duration and the regularity of depressive incidents. Know when an episode is looming. Conduct research on what makes you feel better. Take good care of yourself. Read more of writenlive’s story. 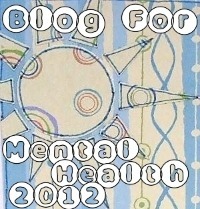 Visit Blogging for Mental Health « Read Write Live. This entry was posted in Read Write Live and tagged Blog For Mental Health 2015, health and wellness, mental health on 2015/03/22 by Ruby Tuesday. I have always, to my shame, looked down on people who had Depression. I genuinely thought depressed people were “ssaaaadddddd”, not in the emotional sense, but in the derogatory “what-a-LOSER” sense. I never thought it would affect someone like me. I was diagnosed with Major Depression Disorder in September 2014, almost six months ago. At the time I was struggling to concentrate at work. Simple tasks took two hours instead of ten minutes to complete. I had problems sleeping. I would wake up at 5am every morning, in a complete state. I would be drenched in sweat, certain that someone had turned off the oxygen supply in my bedroom. I couldn’t breathe. I was going to die. It was truly awful. I would panic like this until I had to get up for work. By the time I arrived at work, it felt like I had wrestled a bear. And lost. . . This continued for many months until my boyfriend took me to the GP. . . I believe everyone would profit from a stay in a psychiatric hospital at some point in their lives. It was highly rewarding, and for the budding writer, The Clinic was rich in anecdotal treasures. Being with other “normal” but depressed people made me realise that this is a disease that doesn’t discriminate. Depression doesn’t care if you’re pretty, or young, or well off. It doesn’t care that you’re usually a happy person. Depression doesn’t see colour, status or class. It will gobble you up and spit you back out. When I left The Clinic, I was determined to do all I could to bring an end to the stigma that surrounds mental illnesses. I believe that if you’ve been affected by a mental illness, it is your moral duty to educate others about its effects. Depression is hard, but people’s reactions to it makes it harder. Read more of depressiondarling’s story. Visit My Pledge | Depression Darling. This entry was posted in Depression Darling and tagged Blog For Mental Health 2015, health and wellness, mental health on 2015/03/22 by Ruby Tuesday. I was twelve years old when my mother first mentioned the psychiatrist. My sweet mother wanted to take me to see one. All of my quirks had become far more than just the tantrums of a short-tempered child. I’ll never forget the solemn expression on her face. Her eyes were tearful as she tried to explain why she thought we needed to see a psychiatrist. She had the same look that I saw in myself when I glanced in the mirror after having a nightmare; deep dread and anguish. The monsters that chased me in dreams — that lurked beneath my thoughts — they seemed to have manifest into a shadow that she could see. I wondered with fright, if perhaps she saw me as a monster too. All I knew about psychiatrists was that they were evil doctors who locked people up in white padded rooms and drugged them with medicine that made the patients “retarded.” I didn’t want to meet with such a doctor. I didn’t want them to put me in that lonely, horrifying white room. I hated white. I hated needles. I hated crazy people. . . I told my mother — in a fierce hysterical tantrum — that she was a bad mother. I told her she didn’t love me. I told her what happened to people with psychiatric records; their lives were ruined. No one wanted them. That’s all I had ever heard — how bad it was to be crazy — and I called her the worst mother in the world for wanting me to live with that stigma. This entry was posted in VOLATILE STABILITY and tagged Blog For Mental Health 2015, health and wellness, mental health on 2015/03/22 by Ruby Tuesday. I still have the current diagnosis I had when I started this blog: Schizoaffective disorder bipolar type and Borderline Personality Disorder. These are my two core mental illnesses with other diagnosis relating to symptoms found in each of these. However, my treatment has been very different since I started this blog, I’m on completely different medications. . . I no longer have just a case manager and psychiatrist but also a therapist and intensive case manager. I started a year long DBT program a few weeks ago. It’s been a little over 2 years since I have last self harmed. I’m more confident in myself and my sexuality, although there is still a ways to go. The voices have stopped completely last year in February. . . One of my longest and toughest depressions just ended last October with another medication change and hospitalization. I feel with the more biological aspects finally under control with medication I can work on the other issues and that’s what I’m looking forward to in 2015 and with sharing progress and the possible setbacks with Blog for Mental Health 2015. This entry was posted in Marci Mental Health & More and tagged Blog For Mental Health 2015, health and wellness, mental health on 2015/03/22 by Ruby Tuesday. Read more of Trauma and Dissociation’s story. Visit Blog for Mental Health 2015 | Trauma and Dissociation. This entry was posted in Trauma and Dissociation and tagged Blog For Mental Health 2015, health and wellness, mental health on 2015/03/22 by Ruby Tuesday. End The Stigma is all about raising awareness for mental illnesses and working toward erasing the stigma, so I thought I would include this blog in the Blog for Mental Health 2015 Project. . .
Read more of End The Stigma’s story. 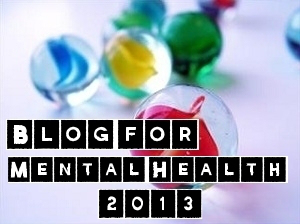 Visit Blogging for Mental Health 2015 | end the stigma. This entry was posted in end the stigma and tagged Blog For Mental Health 2015, health and wellness, mental health on 2015/03/22 by Ruby Tuesday. Today, well, all week, actually has been one of those weeks when everything just seems off. I have never been officially diagnosed with anything other than depression/anxiety. Not that that isn’t enough. But I know there is more going on, in me and in my whole family. My brother is the only one that has been diagnosed..He was considered Schizophrenic from an early age and growing up with him was very trying, especially when it was all supposed to be a secret. We weren’t supposed to talk about it. He didn’t finish school because he was “slow”. So much time was focused on him that no one noticed that the rest of us had issues also. We have had 4 suicides in a 10 year stretch. The more tragedies that we have, the less we talk. I haven’t spoken to some of my family in 8 years due to the fact that I asked too many questions on why we are the way we are. And since some don’t believe that they are anything less than perfect, I am the outcast. I am the troublemaker. We have had a few more attempted suicides and even more have become alcohol ad drug dependent. I am ready to come out and face the problems and I want to teach my children that this should not be something kept secret. Talk to me, talk to someone. I need to get help for myself and then maybe I can help my children and the other younger generations. Read more of Bynda’s story. Visit Blog For Mental Health – New Peace, Old Mind. This entry was posted in New Peace Old Mind and tagged Blog For Mental Health 2015, health and wellness, mental health on 2015/03/22 by Ruby Tuesday. Imagine each morning, you wake up, get out of bed, and begin the routines of your day~ dressing, going to work, running errands,…~ all the while strapped to a boat anchor. You can carry it, you can drag it, you can put it in a wheelbarrow, but you cannot remove it. It is with you ALL the time. You try to get others to help you with it, but they often refuse, saying that it’s YOUR problem, not theirs. They tell you that you should just drop it~ why would you carry that around with you? They frown and say it’s your own fault for tying that thing so tight anyway~ you did it to yourself. They tell you that having a boat anchor tied around your waist is a sign of weakness, and that anyone who has one is just seeking attention or something. Living with mental illness is like living with an invisible boat anchor tied around your waist. Others don’t see what it takes to cope, to get through a day, to feel good about living with a boat anchor tied around your waist. Sure, there’s tons of research out there. There is help. There are thousands of therapists, counselors, self-help books, groups, and clinics who claim to have treatments. Answers. The Cure. But the fact is that the boat anchor stays firmly in place, and you get to drag it around with you again. And again. And again. . . Mental Health is the goal. Acknowledging that, for all our twisted, tearful resistance to the boat anchor, we are capable of living fulfilling, satisfying lives. Each day is a new opportunity to plot our course in that direction. . . Mental health matters. While my posts may not directly address mental health topics, this blog is a component in my process. From surviving to thriving. Failures and successes. I’m hopeful that if you wrestle with your own boat anchor, you find something that lightens your burden, shares your grief, makes you laugh. You are not alone and neither am I. Read more of destrudowoman’s story. Visit What It’s Like… | The Cosmic Carousel. This entry was posted in The Cosmic Carousel and tagged Blog For Mental Health 2015, health and wellness, mental health on 2015/03/10 by Ruby Tuesday.
. . . I was both the victim and perpetrator of bad treatment. Competition instead of patient self discovery (developing true skills and interests) led to rash choices and disappointment in outcomes that did not boost my worth. Until I became a mother, it was possible to function this way because I could uphold appearance through control. After the birth of my twins, I was ashamed to admit I had postpartum depression. I believed that the fact that I didn’t bond instantly with my boys or feel overwhelming love towards them meant I was a bad mother. I hid the confusion and ambivalence I felt instead, refusing to accept treatment. . . I was diagnosed with major depression instead of postpartum depression (it had been more than a year since giving birth.) This diagnosis rankled me. Now I wanted postpartum depression. It would be much more acceptable and understandable than just depression. Depression implied I was unhappy with my life (wife, mother, stay-at-home wife/mom) whereas postpartum depression was a chemical imbalance induced by birth and therefore not my fault. It was all about blame, acceptable explanations, and shame. . .
Read more of cardamone5’s story. Visit Sidelines | Breaking the Cycle. This entry was posted in Breaking the Cycle and tagged Blog For Mental Health 2015, health and wellness, mental health on 2015/03/10 by Ruby Tuesday. Hi all… I’ve been diagnosed bipolar and major depressive since I was around 19 and I’m now 46 and trudging along in life. I hate the stigma mental health has and if I can be a small part of awareness that this is a disease and not something we make up in our mind, all the better. I work full time and go to school part time, am married, and have two fur babies, Moses and Pepper. Read more of Tammy’s story. 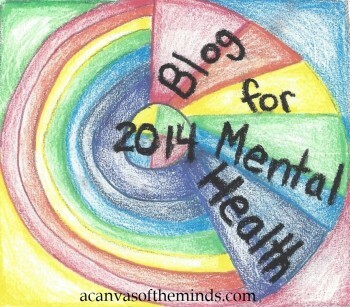 Visit Around In Circles: Blog for Mental Health. This entry was posted in Around In Circles and tagged Blog For Mental Health 2015, health and wellness, mental health on 2015/03/10 by Ruby Tuesday.